​With the 20th Century Society, we explored how Wembley has grown since the start of the 20th Century and how its buildings help fuel the growth of "Metro-Land". Starting at the site of the former British Empire Exhibition (1924), we saw the changing face of Wembley from Owen Williams’ 1934 Empire Pool (now Wembley Arena) to the new Brent Civic Centre by Hopkins Architects. We saw the old Brent Town Hall, now an International school, before exploring the modernist influenced housing of the Haymills estate on the slopes of Wembley Hill, by Welch, Cachemaille-Day and Lander. We had a welcome shelter from the cold in the Church of the Ascension, designed by J.Harold Gibbons, and refreshments served by Olwen and her team. We then finished off by passing by a few of Wembley’s lesser known modernist buildings before returning to Wembley Park Station. For the fourth year in a row we held our Stanmore walking tour for Open House London. Despite the rain we had over 100 interpid explorers make their way out to the end of the Jubilee Line to see some great art deco and modernist houses. We started at the Warren house estate opposite Stanmore station before moving up Stanmore Hill to see some one off inter and post war house. Thank you to everyone who came and braved the rain! Images courtesy of Michael Wright of Modernist Tourists. Following the success of our Western extension Central Line tour last year, this year we explored the Eastern extension Central Line Stations. Starting at Wanstead, and taking in Redbridge, Gants Hill and Newbury Park, we examined some of Charles Holden's final stations for London Underground. We will also saw Oliver Hill's fabulous Newbury Park Bus station, plus some other art deco and modernist buildings including Frederick Gibberd's Fullwell Cross Library and Leisure Centre. To celebrate the anniversaries of Charles Holden’s birth on May 12th and 85 years since some of these stations opened, we held Piccadilly Line tour again. Starting at Turnpike Lane and working our way up to the terminus at Cockfosters, we visited some of Holden’s most iconic London Transport work. Taking in the stations of Turnpike Lane, Wood Green, Bounds Green, Arnos Grove, Southgate and Cockfosters, we will also noted other modernist buildings along the way, such as Curtis and Burchetts work for Middlesex County Council. Undoubtedly the highlight of the day was being invited into the control room at Arnos Grove by Graham, to see how the controller can see everything going on in the station. 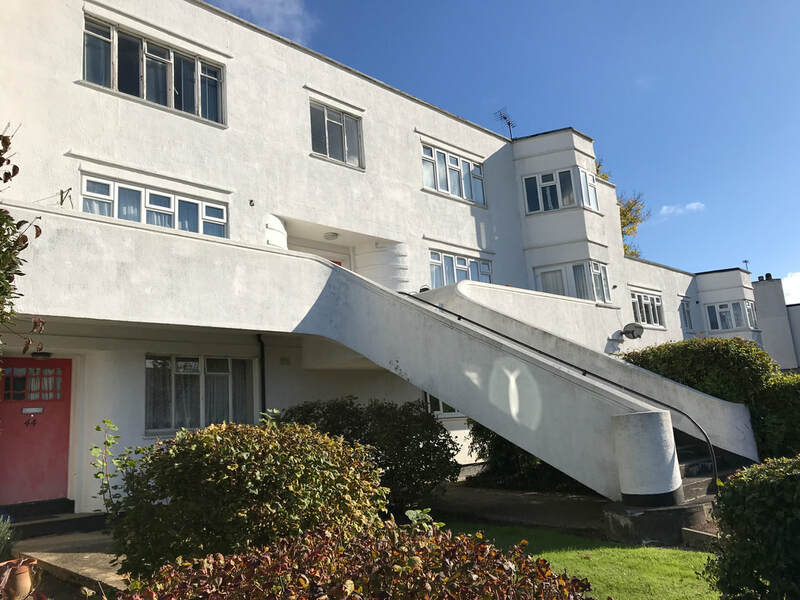 We returned to Stanmore for a walking tour of art deco and modernist houses as part of Open House London on Saturday 16th September. We had a wonderful turnout, with nearly 150 people attending! We were also lucky to have a number of the householders come out and speak to us, on both the positives and negatives of living in listed houses! Beginning on the Warren Estate, featuring a host of interwar Art Deco and Streamline Moderne houses by Gerard Lacoste and Douglas Wood Architects, we explored other dwellings by the likes of RH Uren, Owen Williams, Gerd Kauffman, Rudolf Frankel and others. We also saw how the expansion of rail and road links fuelled the rise of Metro-Land, and how architects bought modernism to sit amongst the prevalent suburban tudorbeathen style. Exlporing the garden of 16 Kerry Avenue by Gerd Kauffman. The owner of 1 Aylmer Close by Edward Samuel explaining the challenges of living in a listed house. We explored the unheralded Central Line extension stations from Perivale to West Ruislip. These stations were delayed due to World War 2, and the subsequent labour and material shortages. We saw the work of a variety of architects such as Brian Lewis, F.F.C. Curtis and John Kennett & Roy Turner, and how they dealt with these problems and the burden of taking over from Charles Holden. We also saw two contrasting post war churches in South Ruislip; St. Mary's and St. Gregory's; and we were lucky enough to be kindly shown inside St. Mary's by Father Eric. Start of the tour at Perivale Station designed by Brian Lewis. Father Eric pointing out St. Mary's design features. Again we ventured from Turnpike Lane up to Cockfosters, exploring Charles Holden's Piccadilly Line extension stations. 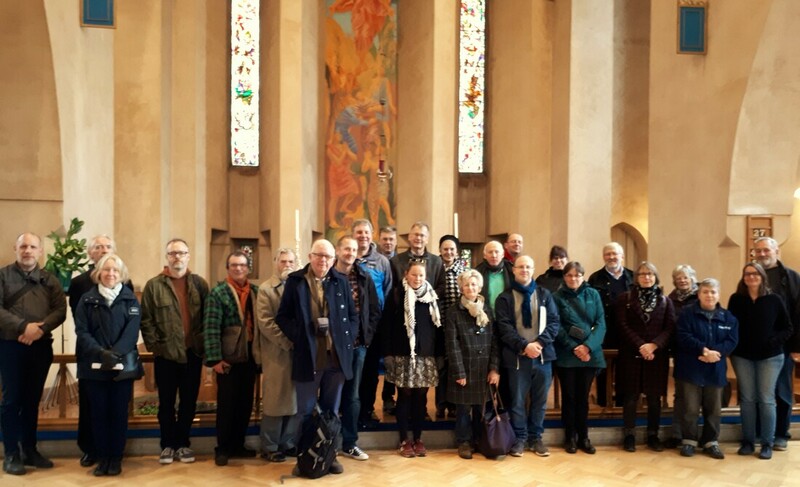 We visited the stations of Turnpike Lane, Wood Green, Bounds Green, Arnos Grove, Southgate, Oakwood and Cockfosters, as well as seeing a selection of interwar cinemas, churches and public buildings. Beginning on the Warren Estate, featuring a host of interwar Art Deco and Streamline Moderne houses by Gerard Lacoste and Douglas Wood Architects, the walking tours explored other dwellings by the likes of RH Uren, Owen Williams, Gerard Kaufman, Rudolf Frankel and others. We saw how the expansion of rail and road links fuelled the rise of Metro-Land, and how architects bought modernism to sit amongst the prevalent suburban tudorbeathen style. We explored the western extension Piccadilly Line stations of Charles Holden, including Sudbury Town, celebrating its 85th Birthday. As well as tube stations, we saw a number of other modernist buildings, including St Pauls Parish Church by NF Cachemaille-Day, Rayners Lane Grovesnor Cinema by FE Bromige and the Hanger Hill estate by Welch, Lander & Day. Rayners Lane Station by RH Uren and Charles Holden. Saturday May 14th- Piccadilly Line Stations Turnpike Lane to Cockfosters. To coincide with Charles Holden's birthday on May 12th, we visited his iconic eastern extension Piccadilly Line stations, starting at Turnpike Lane and finishing at Cockfosters. Along the way we also saw art deco cinemas, modernist churches and some of Curtis and Burchett's work for Middlesex County Council. 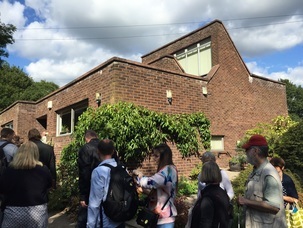 ​As part of Open House London, we hosted a waking tour of art deco and modernist houses in Stanmore with over 100 visitors. Taking in the Warren Estate houses of Gerald Lacoste and Douglas Wood Architects, we also saw post war houses by Gerd Kaufmann, Rudolf Frankel and Edward Samuel. The highlight of the day was being invited in to No.16 Kerry Avenue by the owners Ian & Cherill Scheer.